Waiting to board a train in London, knowing my smartphone battery was flat, and that the UK trains are too cramped to open a laptop on, I bought myself a magazine or two. It was like a trip down memory lane. I’ve caught that train to the ‘burbs many a time in my life, but not for a decade or two, and I’d not bought a magazine to read on a train for probably the same length of time. It was great. Of course, the choice of magazine mattered: in this case Wired and Private Eye. Flicking through each for a first inspection, mentally noting the places I wanted to go back to, removing all the detritus that would otherwise drop and litter the platform, enjoying the contrasting feel of Wired’s gloss and the Eye’s rough-hewn paper. Wired is now on the iPad and, I heard, pretty impressive. The Eye, meanwhile, looks identical to its earliest iterations in the 1960s. Same layout, same paper, same logo, same jokes. The point is this: physical magazines—paper—are not going to die out. Any more than radio is going to die out (I learned from Wired that 80% of music is still listened to on the radio.) Any more than torrents will kill TV. Or laptops will kill desktops. Or netbooks will kill iPads. We think too binary, too winner-takes-all. But some things have changed, and I am surprised that print media hasn’t caught up. Whereas in the past I might, had I felt the urge, snipped out a story I found worth keeping in the magazine I was reading, I’d be a fool to do that now. My days of cuttings are over: Since all my libraries are digital, why on earth would I want to start building one of bits? Of course, there are tools for this: Evernote, for example, lets me take a photo of something and will store it in a database having scanned it for words, so I can use those words to search for it in the future. The world of Facebook and twitter is a world of annotating and sharing, and we’re used to see articles online whore themselves out with little icons at the bottom encouraging us to do just that. But what I’d like to see is traditional media, having already embarked on a bipolar world of digital and atoms with their online versions and their print editions, do a better job of matching the two. For example: I have really enjoyed reading Wired in print. I’ve read stuff I would never have read online: partly because I’ve bought the magazine for $7 (shocking myself and the shop assistant who I felt was about to say “You know you can read most of the stuff in here online for free, right?”) and I want to get my money’s worth. But it’s also partly because it’s so dang portable. And my that I mean not that I can read it on planes and on the sofa, a la ebooks and iPads, but also at all stations in the bathroom bar the shower, if you know what I mean. And at breakfast, spilling coffee and muesli over it. But the problem is the annotation. Nowadays we expect to be able to share and store stuff. I found myself wanting to share some of the stuff I’d read and realizing I couldn’t. Well, I could have grabbed a passing waitress and told her about the interesting snippet I’d come across, but that would have been weird. I wanted to be able to save some of the stuff online for later. But I couldn’t. At least I couldn’t easily and seamlessly. I could search online for the same article, but Wired are smart/dumb: they don’t put all the stuff in their magazines online. This is where I think publishers need to be smarter. I would like to see them use QR tags—barcodes—to help those people dumb/smart enough to buy their premium print copies save what they have in post-print formats. Each article, for example, would include a barcode which you could snap with your camera phone. That would automatically save a copy of the article to your online account, or email it to you, or however you want to save it. It wouldn’t be fiddly: it would be easy as highlighting it. For me, I’d rest easier knowing that my reading is not ephemeral. For the publisher, they will collect data about their offline readers, and, at least in my case, start to rebuild a relationship with a reader they lost about a decade ago. The equation has changed. Just as journalists must now think beyond the next headline in the way that they produce news, media publishers need to think beyond getting eyeballs to their new content. In the end, publishers should try to make it as easy as possible for consumers to not only access their content, but to store it, because that’s the way to build loyalty. Now, if you’ll excuse me I need to find some scissors to cut out these articles I found interesting. Once the magazine’s dried off from being dropped in the bath. I’m always amazed at how weak the market for scanners is. The devices aren’t always that good, and the software that accompanies them is generally speaking pretty awful. Those that were once good, like PaperMaster, are now dead. So it’s good to hear that NeatReceipts, once interested mainly in, well, scanning receipts, is now called The Neat Company, and is about to launch NeatDesk – “the all-new desktop scanner and digital filing system.” It’s got what looks like a pretty cool Automatic Document Feeder scanner that will take receipts, business cards and documents—in the same scan. I used NeatReceipts and thought it was a good effort—it did a good job of trying to parse receipts, although the user interface was overly complex and the software not particularly stable. Neat Co says the software has been completely overhauled. The device is going to sell for $400+ once it’s launched. More anon. Update: Evernote have added PDF preview for Windows. Is there room anymore for Paperport and its ilk? This is a great addition to Evernote and something I think really pushes it into the ‘capture all your cr*p’ category. Good on them. A reader tells me that PaperMaster, the once great scanning and file saving software, is no longer available. Tech support, the reader says, says only that the product was pulled today and no other info is available. 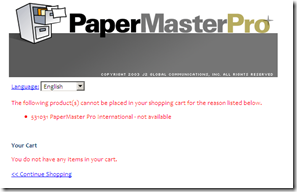 Try to order one online and the message ‘531031 PaperMaster Pro International - not available’. A sad end to what was once—and for many still is—the best program for scanning documents into folders where you can easily find them again. Paperport just isn’t quite the same, somehow. That said, the company that bought PaperMaster, j2, have had it coming to them for a while. I found them unhelpful in my efforts to review earlier versions of the software, and this blog has been something of a gathering point for disgruntled users. Sad, really, given that there are lots of users still out there. If you’re in that boat, and you’re still looking for a replacement, you might want to try Evernote. It’s not quite ready to do what PaperMaster did, but they’re promising PDF thumbnails (Macs already have it, natively) so you might find it works for you. A lot of folk ask me whether they should buy a scanner: those things that take bits of paper, or photographs, and turn them into files your computer can use. Frankly, I'm surprised by this (not the taking and turning, but the asking). Why would people not have a scanner? I have four. Well, five, actually, if you include that little business card scanner sitting in a drawer somewhere. OK, six. I bought a backup scanner once in case all my other scanners eloped. I scan every piece of paper that I can. I scan whole books I want to read on my computer. I scan coworkers who pass me in the corridor. The truth is that scanners can save you lots of time, space and pain. But I readily accept that my passion for scanning may not have won you over. First off, don't get your hopes up. Twelve years ago I bought a scanner that, lulled by the pictures on the box of pages flying into my computer, I thought would rid me of a ridiculous four-drawer filing cabinet full of stuff I had been lugging around Asia. I was to be disappointed. Scanners won't digitize everything paper, I learned, and sometimes they will but will take so long the task won't be finished in your lifetime. 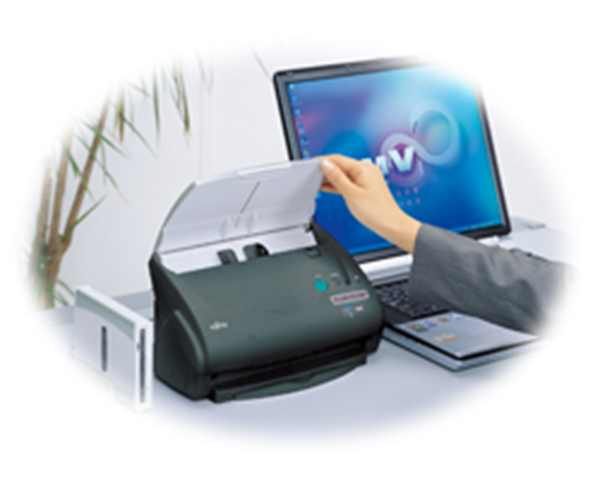 No, scanners won't make you paperless, but they may lighten your load. These can be cheap: Less than US$100 will buy you a quality Canon device. These are good, and do the job well. They're fine if you've got the odd document or photo to scan, or the odd chapter in a book you want to store on your computer. But they're not good if you've got lots of stuff. For this, I'd recommend something like the Fujitsu ScanSnap. I have one of the basic models (5110EOX, selling for $300 to $650), which looks a bit like a small fax machine, and it's still going strong after three years of heavy-duty scanning. You can only scan single sheets into it -- none of the flatbed/photocopier option -- but it will scan pages fast, front and back, without you having to do anything other than press a button. The pages are scanned direct to a common file format called PDF. I love my ScanSnap. I will scan all incoming business mail -- bills, receipts, statements, letters of eviction -- which means I need keep no formal paperwork except the odd will or letter from Aunt Maude that has sentimental value. The ScanSnap can also handle business cards, which it can scan more or less directly into Microsoft Outlook. Neither of these options is particularly portable. If you scan and you travel, you may want to consider a small portable scanner. NeatReceipts has two scanners that make more sense if you move around: one a thin, long device that looks more like a truncheon or night stick, and one a small, cigarette box-sized business card scanner. Which brings me to the important bit of scanning: What happens to the document once it's scanned. Most software simply converts a physical thing to a digital thing, but to make the text that is on that physical thing something you can edit, search or add to, you need to run more software over it called optical character recognition, or OCR. This software - which usually comes included with the scanner -- basically looks at the patterns in the image of your document that the scanning software has created and tries to figure out the letters. OCR software nowadays is remarkably accurate, so long as you give it good, clean documents to start with. Don't expect your spidery handwriting or a smudged and heavily annotated tome from the Dark Ages to come out 100 percent accurate. NeatReceipts doesn't just specialize in digitizing and organizing your receipts: The smaller device handles business cards too. But for most jobs, you'd be better off with something like Paperport, which will handle all the OCR for you and also help you organize your documents into folders. Bottom line? Scanning stuff is a very useful way to keep your desk clear and to be able to find stuff. But you have to be disciplined about it, and get a rather perverse joy out of watching paper disappear into a roller. And be prepared to be regarded by co-workers, friends and family as a bit of a freak. James Fallows points out that not everybody back in 1980 believed the computer would replace the typewriter as a writing implement, and that his prediction that the device would be useful incurred the wrath of, among others, the late David Halberstam. James offered to write some articles on a computer, some on a typewriter, and offer a prize to anyone who could tell the difference. No-one took him up. As is obvious to everyone now, but as was not obvious to most people then, the “sound” of people’s writing is overwhelmingly their own sound, not that of the ThinkPad or the quill pen or the Number 2 pencil or even, gasp, the Macintosh. I don't think the 'sound' is the issue. The real difference between the two technologies is that a computer transfers some of the creating process from the head to its RAM. Anyone who has written on a typewriter will know that it's less painful to compose before committing anything to the page, since the price of correction is so high. So the words, once they come out are much more likely to be the final words one uses. Computers meanwhile, allow indefinite revision, so the composition process takes place on the screen. I'm not saying one is better, although I think I probably wrote better when I had a typewriter. I used to take more care over my words; I definitely wrote less, too, which has to have been a good thing. When I joined the BBC in 1987, we only had manual typewriters, and my colleagues looked down their nose at my Canon Typestar, which allowed me to compose a line in the tiny LCD before committing it to the paper. In retrospect, I think they were right: My writing went downhill from then on. I’ve always loved the idea of pens that work with your computer, either transcribing our hand-written notes, or faithfully reproducing our drawings on our computer, but the promise has always dwarfed the reality. Is LiveScribe different? LiveScribe, launched at last week’s D conference, differs from previous digital pens in several ways: instead of merely trying to capture what you write, it captures what it hears, and is able to link what is written with what is recorded. Tap on a word you’ve written and it will jump to that part of the recording. Write something and have the pen translate it into Japanese or Swedish [sic]. All of this sounds amazing. It’s the sort of thing that has the potential for revolutionizing the way we work. Its inventor, Jim Marggraff, says “we can see this changing the world.” Even my colleague Walt Mossberg got so excited about it, according to the San Francisco Chronicle, he “was so determined to have the scoop on the pen, and to unveil it at his conference, Marggraff said, that [New Yorker’s Ken] Auletta (who was writing a profile of Mossberg and in the room when Marggraff was giving a demo) was not allowed to write about it.” Walt doesn’t get excited about stuff very often. But what I find interesting is how hard it has been to get the pen– or paper-based computing thing to where we are now. LiveScribe, for example, is the vision of Marggraff, but also incorporates a lot of technology that came before. He himself was the inventor of the LeapPad (1999), “essentially a cross between a talking book and an educational videogame console,” in the words of a WIRED profile of Marggraff from 2005. It made LeapFrog, the company behind it, the fastest growing company in history. Then Marggraff came up with the Fly, a kid’s version of LiveScribe, which used technology provided by Sweden–based Anoto, the company that developed the technology behind other pen– or paper-based computing systems, including Logitech’s own io Pen. So while there may seem to be a buzz about this product (and there should be; it’s got some great features) it’s actually just the latest offering in a series of innovations that, at least for the adult/professional market, has dazzled more than it has actually won over. For some reason pens aren’t as exciting to users as the idea of pens that do more. Walt may be excited by the product, and so am I. But I’ve learned that’s not always enough: journalists (well, me) have been excited by earlier incarnations of the digital pen and they don’t seem to have caught on either. Why? I think it’s a few factors. Part of it is that all these products seem too fiddly, or at least require a change of habit. Another is Dependability: we need to know they’ll always work or we won’t trust them to do the job alone (recording interviews and writing notes are the sort of things you don’t want to mess up.) Thirdly, it’s because we’re weird about our pens: We either have pens we love and wouldn’t part with, or else we buy a particular brand we like by the truckload and lose them. In either case it’s because we like the way they write, and the ioPen and its cousins all failed to understand that, giving us just a basic Biro-type nib that doesn’t make us want to write. It’s like selling us a beautiful new laptop with a keyboard from WalMart. So, my soapbox lesson for the day: Paper– or pen-based computing is a great notion, and may yet have its day, but developers need to understand that whatever the gizmo can do, it’s first and foremost a pen. (Like a smartphone, however snazzy, is first and foremost a phone.) So make it a great pen first, and then add the bells and whistles. Offer all sorts of different cartridge types and colored inks/gels. Make it a pleasure to doodle with, and then add the technology. Then we’ll grab a hold of the rest of the technology, and this time we may not let go. Palm has a new mini laptop called the Foleo. I like the idea, but I fear it will go the way of the LifeDrive, which I also kinda liked. Microsoft has launched a desktop (literally) device called the Surface. Which looks fun, and embraces the idea of moving beyond the keyboard not a moment too soon, but don’t expect to see it anywhere in your living room any time soon. eBay buys StumbleUpon, a group bookmarking tool I’ve written a column about somewhere. I don’t use StumbleUpon that much but I love the idea of a community-powered browsing guide. Let’s hope eBay doesn’t mess it up like they seem to be doing with Skype. Microsoft releases a new version of LiveWriter, their blogging tool. Scoble says Google is planning something similar. True? This brings me to again plead with anyone offering an RSS feed of their stuff, to put the whole post in the feed. Offline browsing is not going to work if you can only read an extract. Mindmapping has long been dominated by MindManager, which is a great tool, but has its weaknesses (I find the latest version to be very slow, even on small maps.) A new alternative has emerged from the mindmapping king himself, Tony Buzan: iMindMap. Available only in Beta at the moment, it looks promising. (Thanks, Stefanos Karagos.) My own directory of mindmapping tools is here. Talking of maps, I'm also a fan of TreeMaps. (A directory of such stuff is here.) 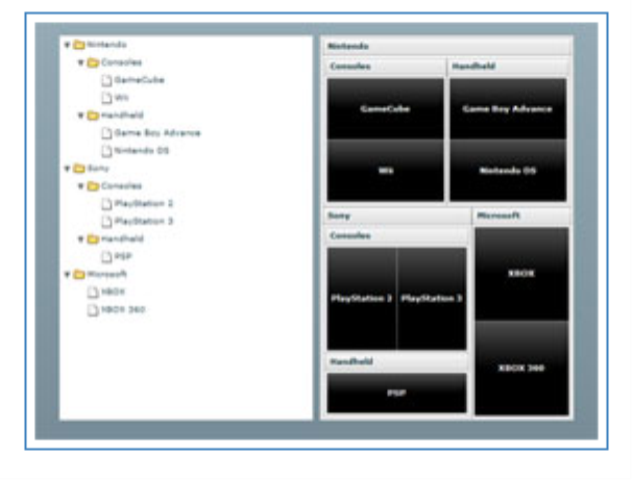 Josh Tynjala is working on a tool which would allow you to make treemaps on the fly. Looks promising, if you like that kind of thing. I love the idea of people selling their customizations of products that already exist. Here are some Moleskine notebooks that have been customized for sale on Etsy. 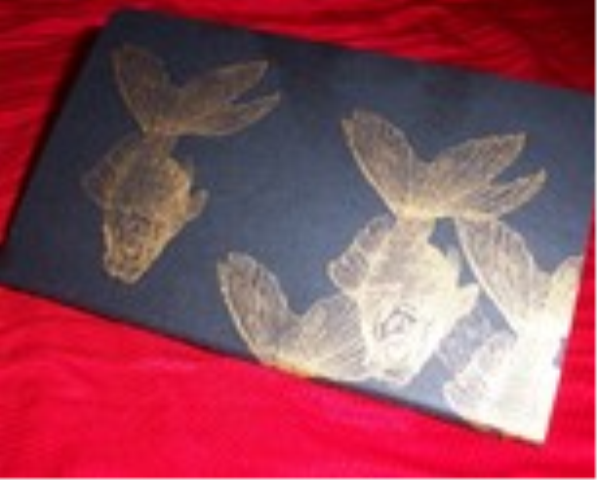 Pictured here is a Moleskine screenprinted with multiples of a goldfish image in sparkly metallic gold ink. Christmas gift ideas, anyone? Ricky Gervaise ends his podcasts. More exploding laptops. Why so many? BlogTalkRadio: A site that lets your podcast go out live. Er, isn’t that what radio is? Andy Delin, the ‘new Scoble’, points out the benefits of Moleskines now that Cameron’s switched. It’s all about history. Dave Weinberger points to Ethan Zuckerman’s fascinating trip to Zimbabwe. You've Read the Column and Blog. Now Read the Book. I promise I’m not going to harp on too much about this, but today marks the moment when Loose Wire becomes not just a column and a blog (and an occasional podcast) but a book. LOOSE WIRE, A Personal Guide to Making Technology Work for You is now available for pre-ordering here. EVER GET THE FEELING that technology is taking over your life and not asking you first? When you’ve mislaid that important file or can’t connect your new camera, do you just want to hurl your computer out of the window? When your kids/friends/grandparents start talking about blogging, podcasting and RSS feeds do you nod as wisely as you can while wrestling with the urge to throw them out of the window too? This is of course a bit excitment for me, because the columns have all been written with a vague idea in my mind that the world of technology could be sliced into thin enough pieces for anyone to digest. Now putting all those pieces back together in book form reveals a kind of pattern that surprised me. Not many surprises in there for the geeks among us, but those of you wanting an accessible guide you can read in the bath might find what you’re looking for. The book is being launched on October 1 in Bali (where else?) at the Ubud Writers Festival which is playing a host to bunch of internationally acclaimed writers, i.e., people not like me. The launch party will be on October 1, 5.30 pm at Tutmak restaurant and café. If you’re around please do drop by. There will be drinks. I will also be appearing on a blogging panel the following day at 2 pm alongside (or probably slightly behind) Deepika Shetty [Singapore], Dina Zamen [Australia/Malaysia] and Sharon Bakar [Malaysia]. There will also be a launch later that week in Jakarta, and then maybe one later in the year in Hong Kong. OK, no more plugs, I promise. Well, not too many. David Elazar on Is PaperMaster Finally Dead? Tom on Is PaperMaster Finally Dead?